Blanca Antizar joins IWA for an IWA webinar on the urban water utility of the future. Blanca provides an overview on how are carbon, energy and urban water inter-related into what we call the water – energy – carbon next, and how does this nexus relate to climate change. Blanca also share insights into how Isle Utilities are working with major water utilities to meet some of the challenges associated with climate change. 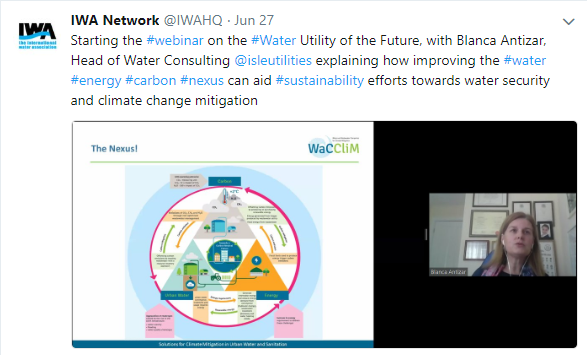 The target audience of the webinar included utility staff (managers, operators) worldwide, with a particular focus on utilities in emerging economies; water professionals advising utilities (consultants, academics); city and national regulators/ policymakers responsible for water and climate strategies. The Water and Wastewater Companies for Climate Mitigation (WaCCliM) Roadmap, which outlines an ambitious process in five general steps, intended to raise a utility’s awareness, capacity, and decision making abilities at each step, was presented.